The Indian government is reportedly buying rights to the same Cellebrite technology the FBI may have turned to when trying to unlock the iPhone of San Bernardino shooter Syed Rizwan Farook. The country's Forensic Science Laboratory in Gandhinagar should have the technology "within a month or so," an official with the lab told India's Economic Times. The person added that they expect the country to "become a global hub for cases where law enforcement is unable to break into phones." The FSL has recruited help from Cellebrite in the past, a second official said, but now the lab is expected to have permanent rights to the technology, which even other forensic units in India will have to pay to access. The FBI has never officially disclosed how it broke into Farook's iPhone 5c, other than it paying for the necessary technology. Some reports have suggested that Israel's Cellebrite was involved, but that may not have been the case. Before successfully breaking into the device, the FBI and the U.S. Justice Department tried to compel Apple's help. Apple refused, arguing that it couldn't legally be compelled to craft new software, and that doing so would fundamentally undermine iOS security. So the Indian govt is betting that Apple hasn't plugged any security holes since iOS 7? Now that we see the FBI is filled with Trumpazoids, I'm even more convinced that Apple's position on encryption is right. I hope they keep amping it up. Well done, you bought tech that can hack into iPhones up to 4 years ago. The secure enclave stopped the ability to read and rewrite the area of memory that this device accessed. I think this is a non-political issue. Everyone should be in favor of encryption regardless of your political standing. The other side feels the same about Hillary. Who knows what zero day exploits are out there. I don't think "trumpazoids" would also be leading an investigation into Paul Manafort, Trump's former campaign manager. The fact that they have investigated your god Saint Hillary does not mean they are for Dump. Let me clarify my rather terse and ambiguous comment. 1. Historically, I have been much more concerned about the political leaders of US intelligence agencies than I have been about rank and file agents/employees. I had assumed the rank and file are professionals who put their duty ahead of their own political views. I don't expect them to be totally a-political, but I also assumed that they would make a good faith, and largely successful, effort to keep their political views and their work separate. 2. Even though Comey is a political appointee, I think Comey is a decent, well-intentioned guy who just exercises bad judgement (a lot). 3. The thing that I find so disturbing right now is that it sounds like there are a lot of rank and file agents (maybe not a majority -- but a scary large number) that are not what I imagined them to be. They are not professionals capable of keeping their political views mostly out of their job. Instead, they are Trumpazoids who flagrantly disregard FBI policy and instructions from their superiors, and leak all kinds of bogus stuff to right wing wacko "news" outlets. I guess for me, this is just another example of the broader experience of the past 18 months -- I'm discovering that a much, much larger proportion than I had realized of my fellow Americans really are evil or stupid people. It seems so unfair that these wankers had the privilege of being born in the best country on Earth. They just don't deserve it. They should have been born in a place like Sudan or North Korea. I thought this hack only worked on the iPhone 5? Listen to this guy, he basically saying Apple users are going to have a might higher level of privacy and the android world will be an open door to anyone who want to see what they are doing. It is another example of the halves and have not, and you can blame google for that not apple. Google could have made it more secure, but doing so would not allow them to collect information on you their users and they licensed it to everyone so every government in the world can look in side including China. This guy is not talking politics here, it the reality of the situation, all be glad you apple users because we all can not trust those who seek to see what you are doing. Listen to first 30 seconds and then everyone can decide whether FBI taking sides or doing the right thing. Make sure you remember this when you vote. The 'best country on Earth" is not the US of A. Sorry old mate but the best country on is ...(drum roll please... wait for it) - AUSTRALIA. Good friendly people, great climate, the best beaches, clean air, no guns, freedom to to do and say as you please (even with 18C) and no heavy FBI / CIA type government agencies to spy on you. Hey even the girls (and guys) and good looking! So come on down (under) and visit. Why would you assume FBI agents, Supreme Court justices, members of Congress or your neighborhood police would be any different from you or me? No one rises above their own self-interest. No one. And there is ample historical and present day evidence which proves that ANY person who operates "above the law" will do so. Checks and balances are essential to the restraint of corruption. This seems to be an immutable law. In the future, if I ever decide to get any type of attack dog to protect my family, I'm going to buy a goddamn Trey Gowdy. Gowdy should run for President in eight years after Trump's second term. Isn't he the guy that wasted 7 million tax dollars on the Benghazi investigation trying to connect Hillary to the tragedy caused by the Rep. congress cutting funds for diplomatic security? Yes, Trey Gowdy: the guy who admits tampering with CIA documents in the investigation he was heading because of arbitrary criteria he just felt was correct and not because he has any kind of agenda. 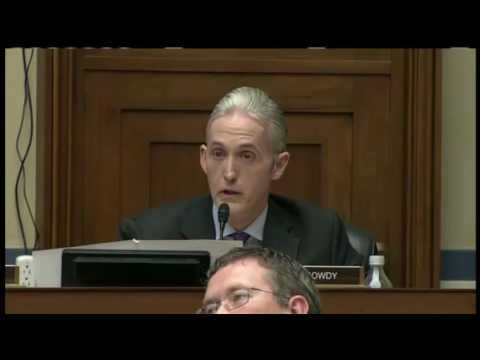 Pardon me if I take any so-called evidence of anything using Trey Gowdy as food for my garbage disposal.